A mola mola, like the one I saw from deck. Today the ocean was crystal clear and the sky partly clear. I saw amazing creatures floating on the still surface of the water — salps, mola mola, and jellies. 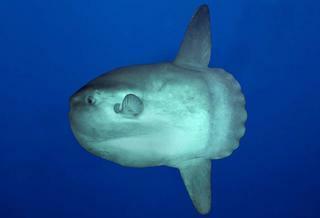 Mola mola, also called sun fish, are flat and float on the surface of the water, seeming to sun themselves, eating jellyfish. The water was speckled with salps, identifiable by their small, jelly-like bodies and dark center. When Jennifer saw the salps, she groaned, explaining that their presence suggests a relaxation in the winds that drive upwelling. Less upwelling means fewer nutrients for the whole marine system. I spent the whole day trying to wrap my head around the fact that the slight winds I feel every day drive such an enormous system as coastal upwelling, and that one peaceful day could cause so many salps to be floating on the surface. Usually there are enormous black-footed albatross all around the ship. Albatross, one of the biggest birds in the world, spend most of their lives at sea, coming to shore only to breed. The albatross I see may be nesting on remote Pacific islands, traveling many days to gorge themselves on fish off the West Coast before returning to their nests. They come to our waters because of all the fish here due to upwelling. An albatross can be away from the nest as many as seven days, returning to regurgitate fish from its stomach, which the chicks will eat. Like many seabirds, albatross fly extremely efficiently. They rise and sink repeatedly as they fly to use the energy from the wind. They also use the rising air that comes off of waves for more lift. I see them soaring without moving their wings, so close to the water that they disappear from view behind small waves. Before flapping, they seem to tilt upward, and even so, their wings appear to skim the water. A windless day like today is a hard day for an albatross to fly, so they stay on the water. I saw very few, all in grounded groups. Instead of albatross, I saw many small diving birds, especially when we came close to the beautiful, jagged coast of the Quillayutte River and La Push, Washington. I saw tufted puffins in bright breeding plumage, surfacing on the water for a few minutes before bobbing back under for surprisingly long times. The day before we set sail, Shelby and I visited the Newport Aquarium, where we saw tufted puffins in the arboretum. We saw the puffins swim through the water in the arboretum, wings flapping as if they were flying. We told a volunteer we were headed to sea. She said to look for single puffins close to shore. This time of year, puffins are nesting in pairs, making nests in burrows in cliff faces this time of year. 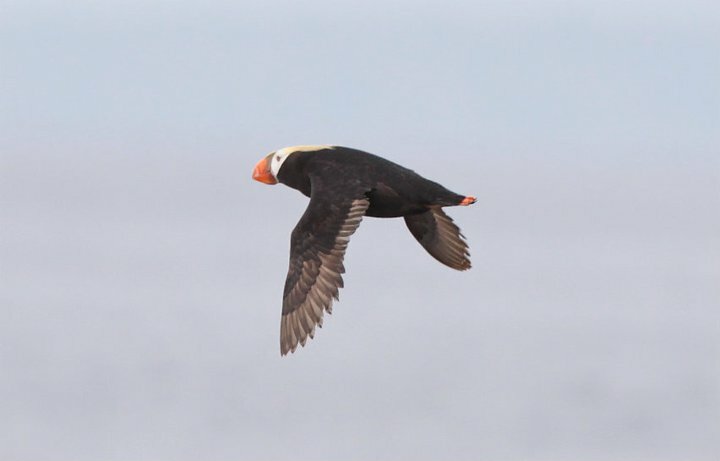 While one puffin stays in the nest, its mate goes to sea, eats its fill of fish, stuffs about another seven fish in its beak, and returns to feed its chicks. The puffins I saw certainly looked like they were hard at work hunting for fish. Today I helped deploy two sonar devices that I haven’t seen before, a sub-bottom profiler called a tow fish, and an Expendable Bathythermograph (XBT). The tow fish is a sub-bottom profiler, meaning that it sends a signal to map the bottom of the ocean. 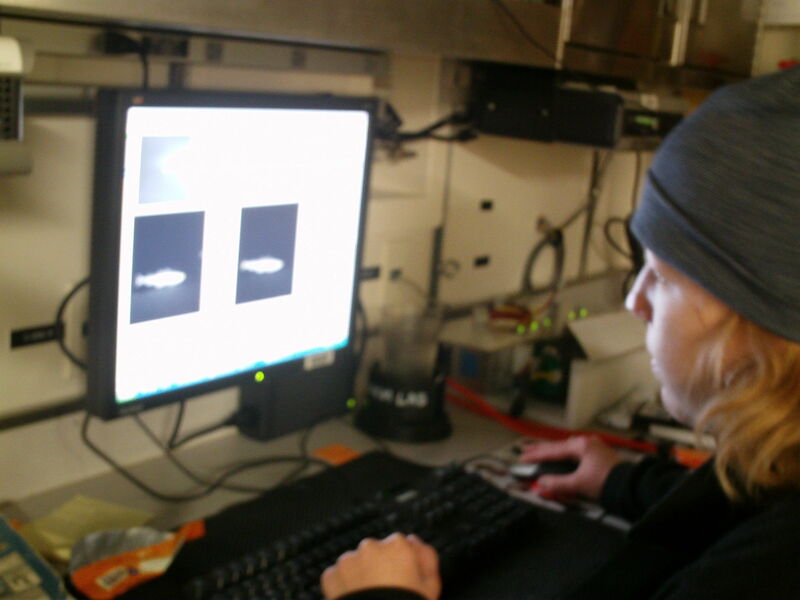 The scientists on the acoustics team are using it to look for fish. We backtracked over a section where we fished yesterday and dragged the tow fish alongside the ship. 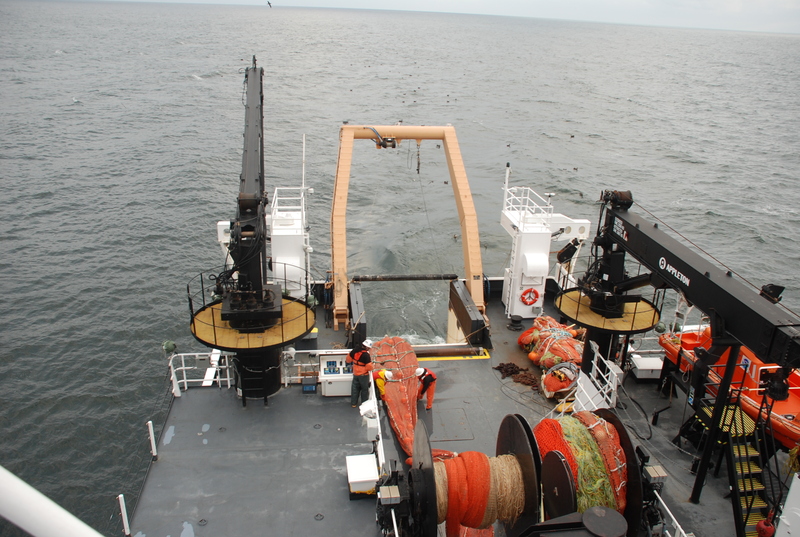 The data from the tow fish will be analyzed later, and proofed against the information from the haul and the other sonars. As usual, the goal is to be able to use the data to identify specifies with more and more accuracy. The XBT is a probe that measures the temperature of the water. Falling at a known rate, it sends the temperature back through two small copper wires, which can be graphed as a function of temperature vs. depth in order to find the temperature profile of the water. Because the XBT looks vaguely like a gun, Larry left earplugs and a mask out for me, warning me about the explosion I was about to make. However, Alicia was in charge. She said, “There’s a hazing that happens with the XBT. I’m a bad liar. 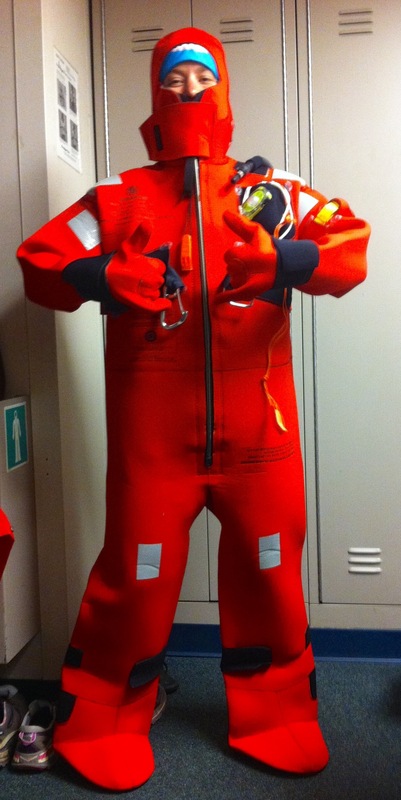 You don’t need this stuff.” So I went out on deck in just a life jacket and hardhat, which are required when doing any operation on deck. Once the technology tech radioed that the XBT had fallen to the necessary depth, I broke the copper wires. They were so thin I could cut them by rubbing them between my fingers. Shelby, my roommate and a student Western Washington University, showed me her work measuring harmful algal blooms (HAB). While algae and other phytoplankton are essential to marine ecosystem because as primary producers, some algae produce domoic acid. Domoic acid is toxic to marine life and humans. 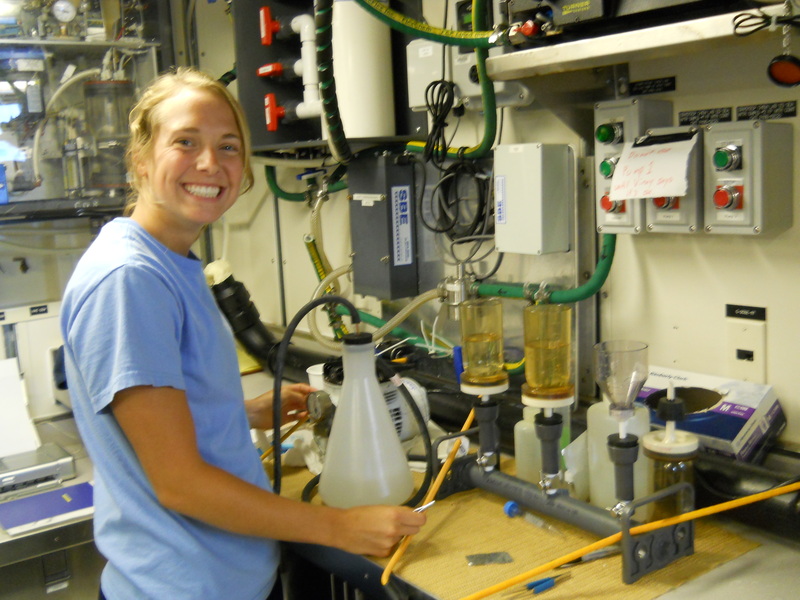 Using surface water collected outside the boat and pumped into a hose in the chemistry lab, Shelby filters the water and saves the filter paper for further analysis of domoic acid and chlorophyll. 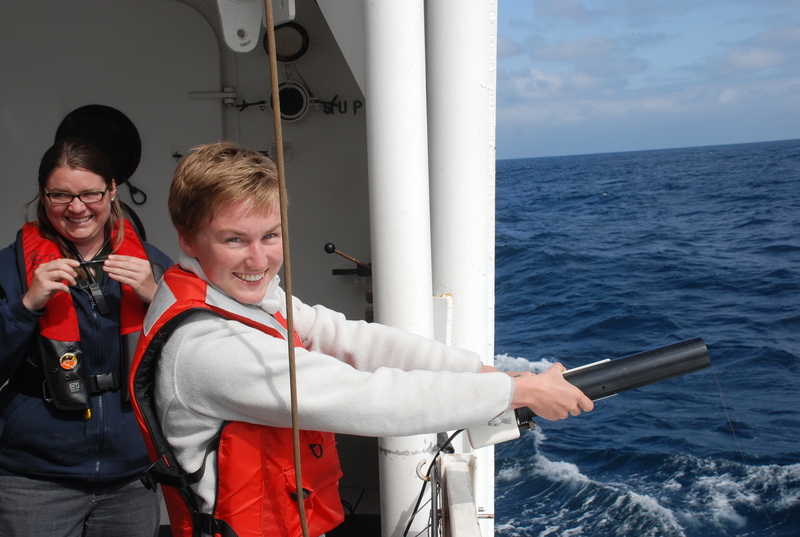 A NOAA scientist will compile her data in an effort to map HAB along the West Coast. 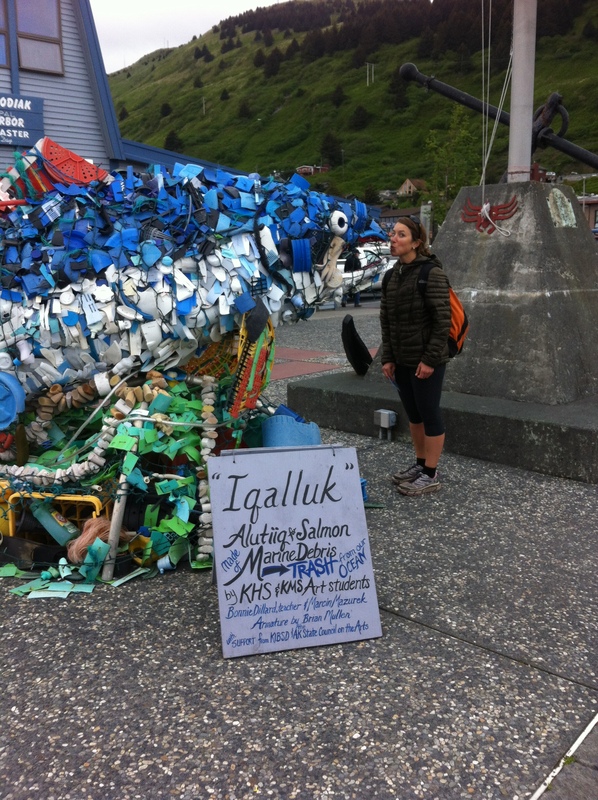 Shelby is a volunteer, one of four college students who each collect the data for one leg of the journey. Life aboard the Shimada seems to suit me very well. Every time I ask a question, which is often, I learn something new, and every time I look outside, I see something I never saw before. Yesterday, I ran into Rebecca in a hallway. Excited, she said, “There’s a P3 about to launch a sonobuoy!” I asked her to repeat. She said, “There’s a P3 about to launch a sonobuoy!” I stared at her. She said, “A plane is dropping stuff. Go outside and watch.” We both had to laugh about that one. Outside, I quickly learned that a marine ship had called the bridge to ask if we would help with a mission to drop a sonobuoy. A sonobuoy is a listening device. With a parachute attached, it drifts into the ocean, where it floats, using passive sonar to report the location of objects like submarines. The day was shockingly beautiful, so a number of us stood on the very top deck of the ship, called the fly bridge or, jokingly, the beach. We watched the airplane circling us and watched the drifting clouds and diving birds. Several people declared it the flattest water they had ever seen in these parts. I am happy to say that, with beginner’s luck, I won the first match of cribbage, placing me in semi-finals, and have started staying up in the evenings playing cards with other people on board. On my last 12 hour shift, a beautiful, sunny day, we started by pulling in, sorting, counting, and weighing fish caught in a mid-water trawl. 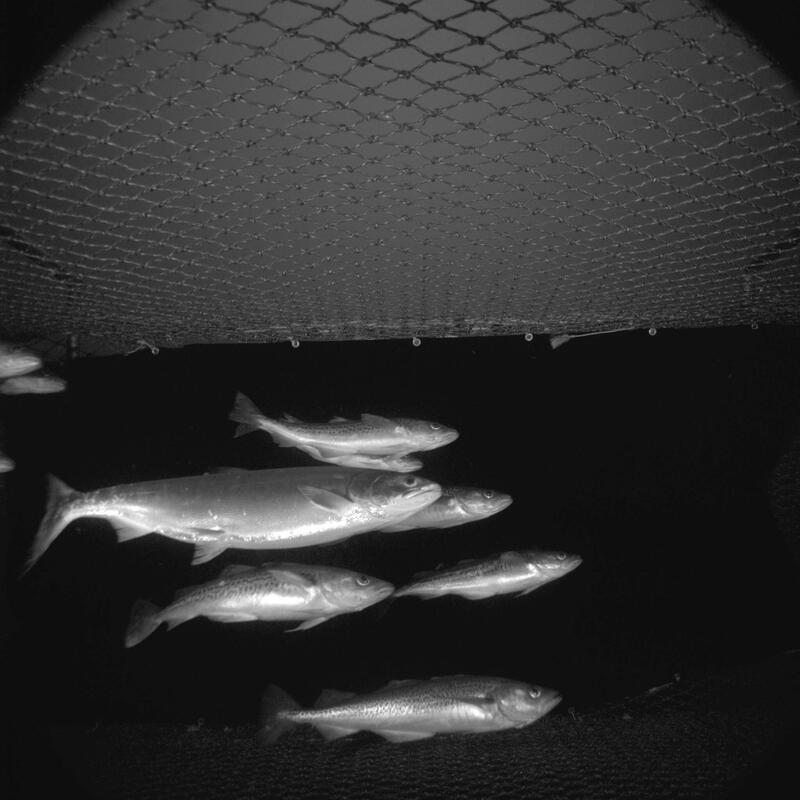 The scientists were also testing out a new “critter cam” that was attached to the net. The trawl net has a special device called a M.O.C.C. which stands for Multiple Opening and Closing Cod-ends. The net has three separate nets that can be opened and closed by the M.O.C.C. when the scientists reach the desired depth or location for catching, this keeps the catches from different targeted depths from mixing together. The three separate nets are called cod-ends. Each cod-end catch is processed separately. In this trawl, we saw multiple jellies, juvenile pollock, krill, juvenile squid, juvenile Pacific sandlance, capelin, juvenile flatfish, and juvenile cod. 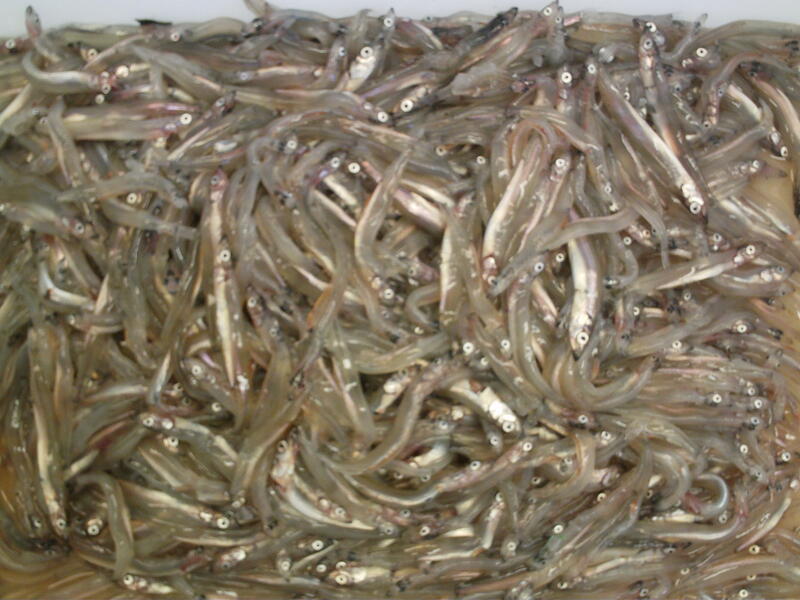 Capelin from our trawl covered the deck of the boat. The Multiple Opening and Closing Cod-end, or MOCC, and net being released to the water for a mid-water tow. Later, we trawled a 2nd time for about an hour. 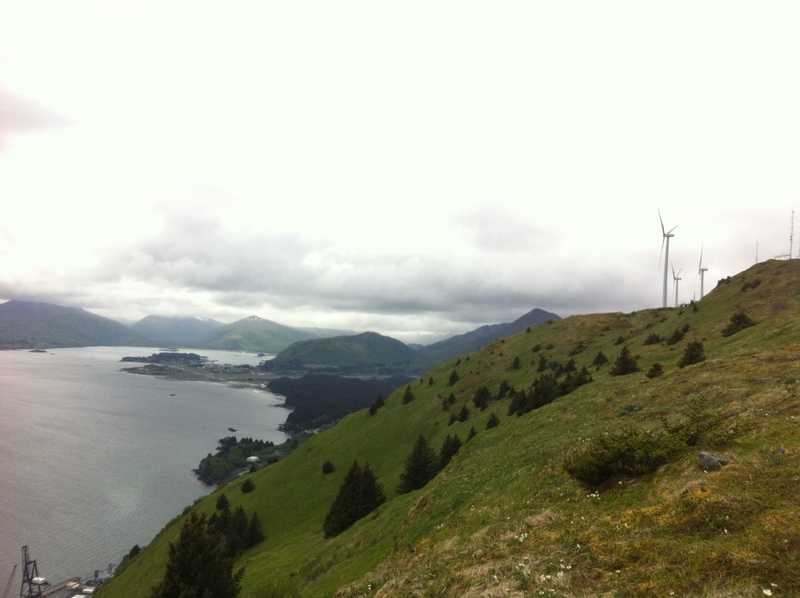 The trawl net used is called the AWT or Aleutian Wing Trawl because the sides of the net are like wings. After the net is in the water, two large steel doors are dropped in the water and help to pull the net open wide. You can see them in the picture above, they are the giant blue steel plates attached to the very stern (end) of the ship. 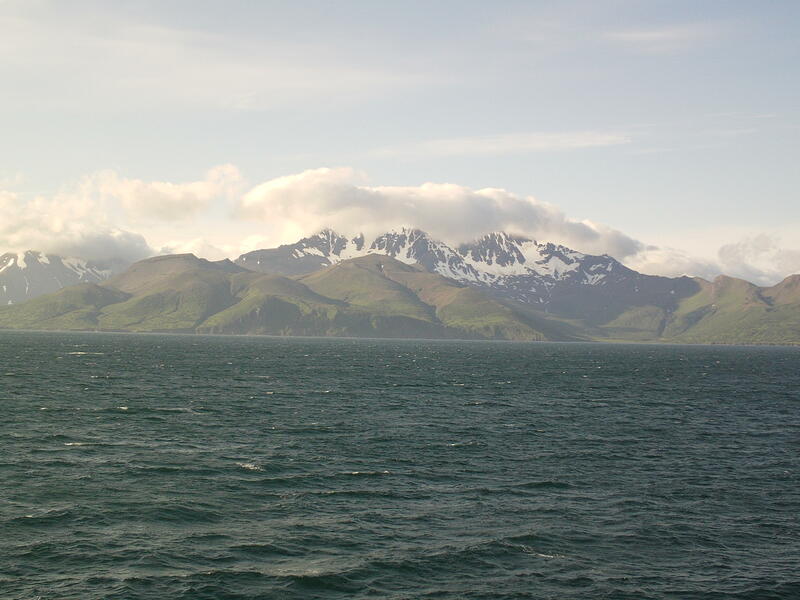 During this trawl, only one cod-end was opened, and the catch was several hundred pounds of Pollock, with some eulachon, capelin, squid and jellies also. 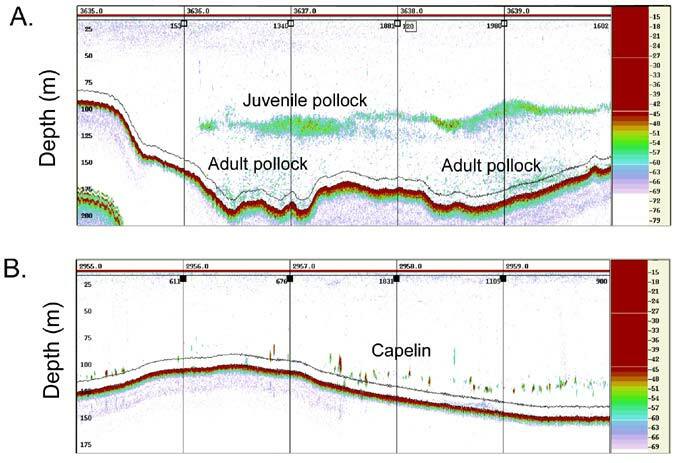 Because pollock are the target fish of this survey, each was sexed and counted, and a smaller number were measured for length and weight, and the stomachs and otoliths were removed. The stomachs are being preserved for another research project back in Seattle, and as I mentioned previously about otoliths, they tell the age of the fish. Today I was happy to have beautiful sunshine and 2 trawls to sort through. The skies and surrounding islands were absolutely stunning. I can understand why people are drawn to this place. It’s wild and rugged and looks like it probably did hundreds of years ago. Scenery of the Shumigan Islands. 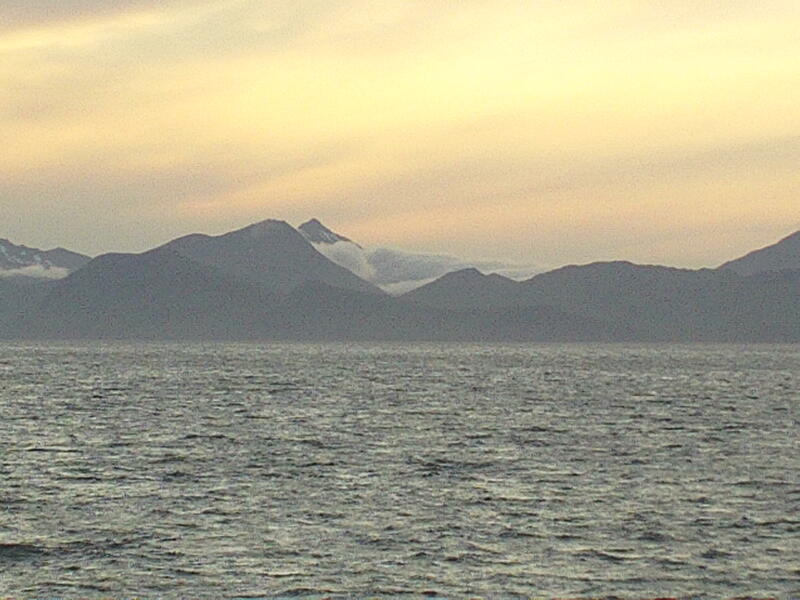 Dusk in the Shumigan Islands. Thought for the day… if I was a blubbery whale, I would live in the Gulf of Alaska. If I was a pollock, I’d try not to get into a net, they can give you a splitting headache. Last night, we attempted a bottom trawl for walleye pollock. 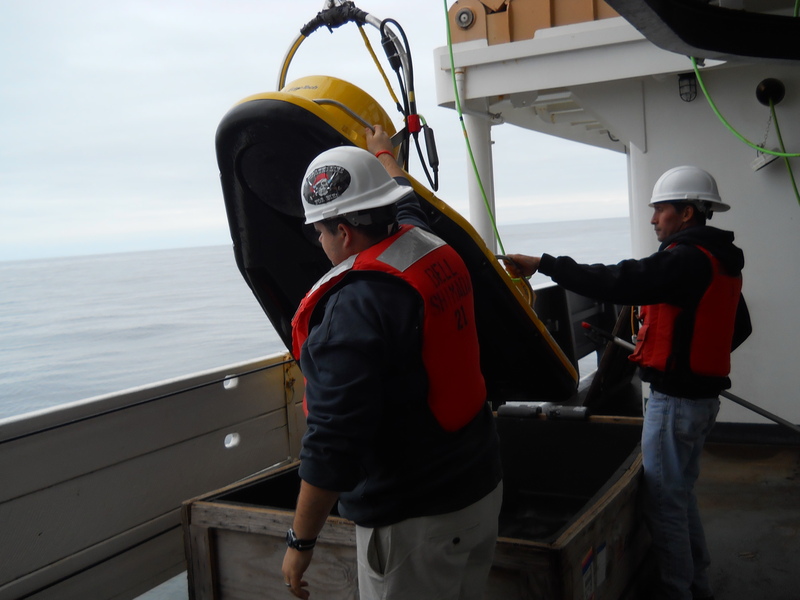 The way scientists know that fish are present is by using acoustic sampling. The centerboard of the ship is set-up with sound emitting and recording devices. When a sound wave is emitted toward the bottom, it will eventually be returned when it hits a fish or the ocean bottom. This is called echo-sounding and has been used by sport & commercial fisherman and researchers for many decades. The sound waves are sent down in pulses every 1.35 seconds and each returned wave is recorded. Each data point shows up in one pixel of color that is dependent on the density of the object hit. So a tightly packed group of fish will show as a red or red & yellow blob on the screen. When scientists see this, they fish! 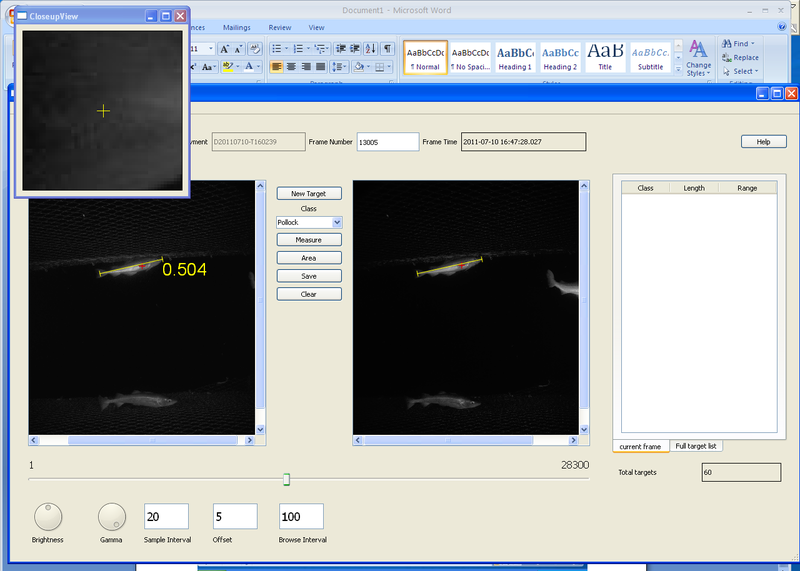 This echogram shows scientists where fish can be found. The scientists use this acoustic technology to identify when to put the net in the water, so they can collect data from the fish that are caught. 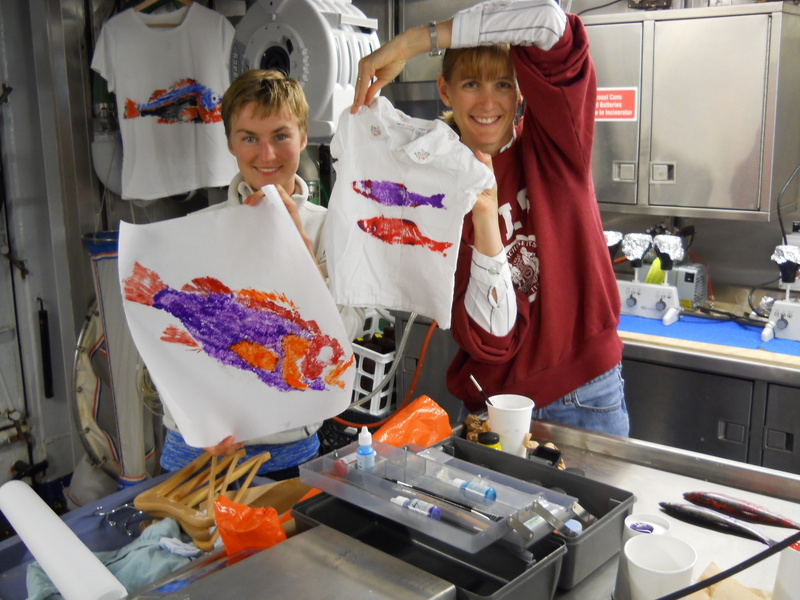 The researchers that I am working with are specifically looking at pollock, a mid-water fish. The entire catch will be weighed, and then each species will be weighed separately. The pollock will all be individually weighed, measured, sexed, and the otolith removed to determine the age of the fish. Similar to the rings on a tree, the otolith can show the age of a fish, as well as the species. These scientists aren’t the only ones that rely on technology, the ships navigation systems is computerized and always monitored by the ship’s crew. 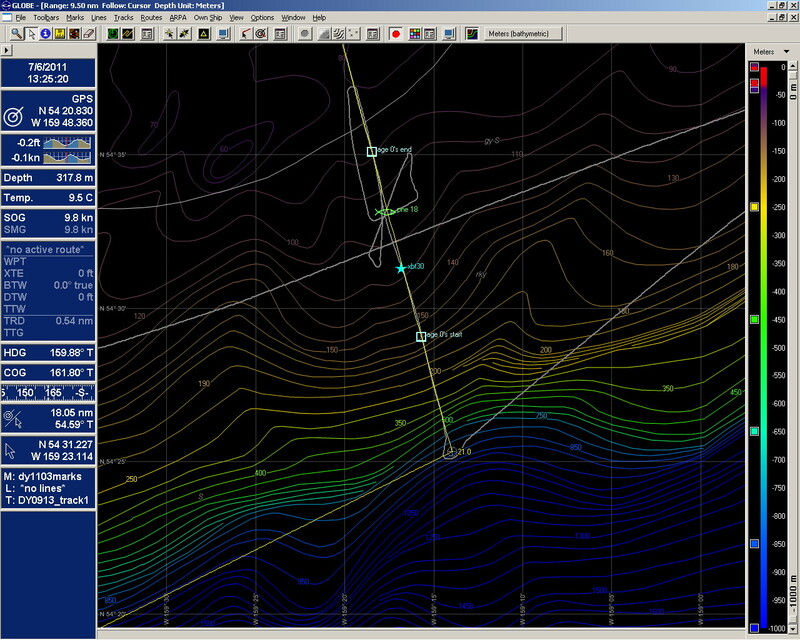 For scientific survey’s like these, there are designated routes the ship must follow called transects. This chart shows the transects, or route, that the ship will follow. This chart shows the route (white line) of the ship once fish were spotted. When scientists find a spot that they want to fish (green fish symbol), they call up to the bridge and the ship returns to that area. 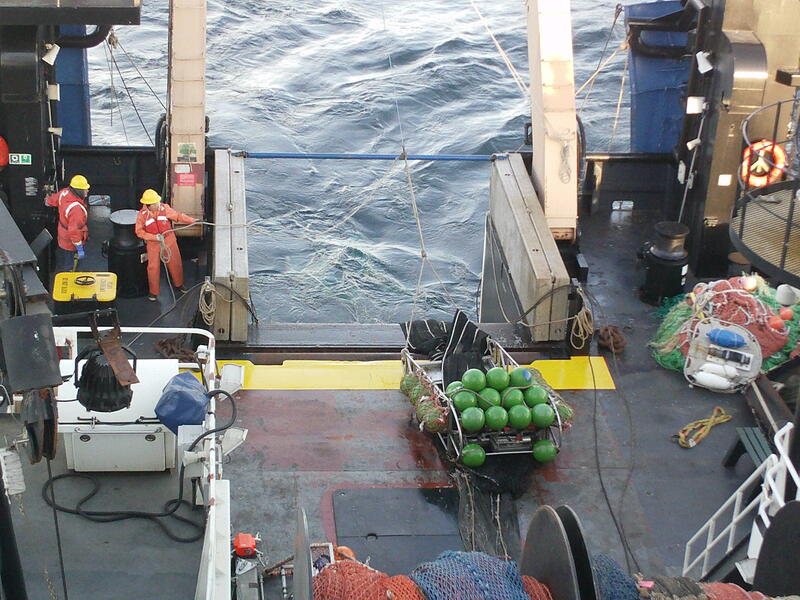 As the ship is returning, the deckhands are preparing the net and gear for a trawl. I think that I must have good sea legs. So far, I haven’t felt sick at all, although it is very challenging to walk straight most times! I’ve enjoyed talking with lots of different folks working on the ship, of all ages and from all different places. Without all of the crew on board, the scientists couldn’t do their research. I’ve been working the night shift and although we’ve completed a bottom trawl and Methot trawl, we haven’t had a lot of fish to sort through. My biggest challenge is staying awake until 3 or 4 am! 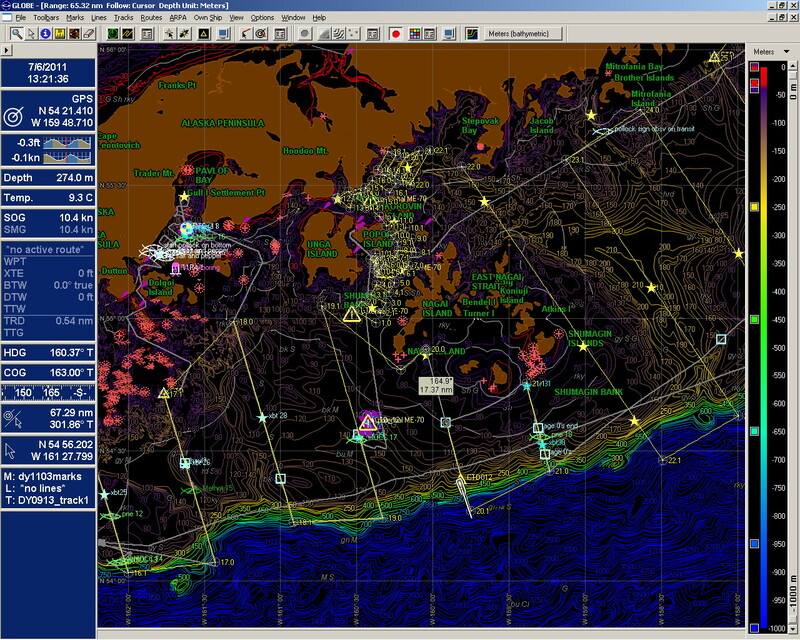 That nautical charts show depths in fathoms. A fathom is a unit of measurement that originated from the distance from tip to tip of a man’s outstretched arms. A fathom is 2 yards, or 6 feet. 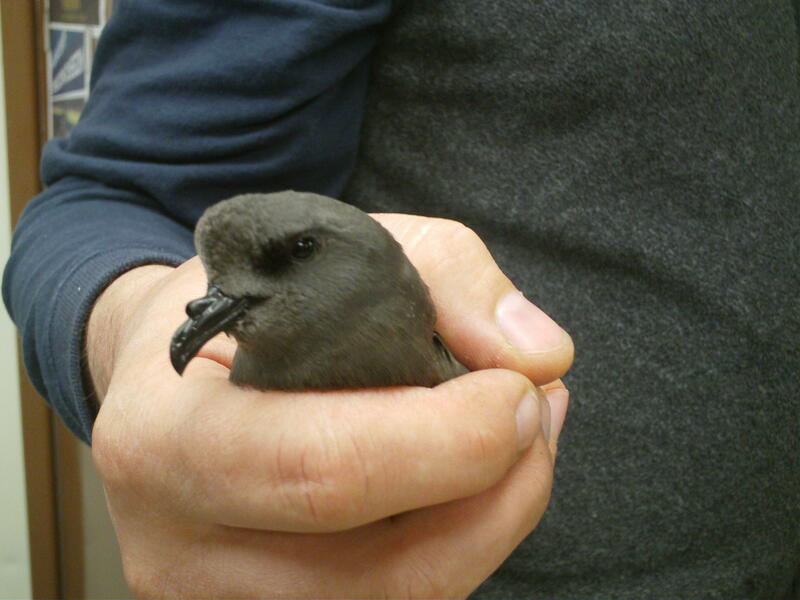 Fish biologist Kresimir found this petrel in the fish lab; attracted to the lights it flew inside by accident. The petrel is in the group of birds called the tube-nosed sea birds. They have one or two "tubes" on their beak that helps them excrete the excess salt in their bodies that they accumulate from a life spent at sea. 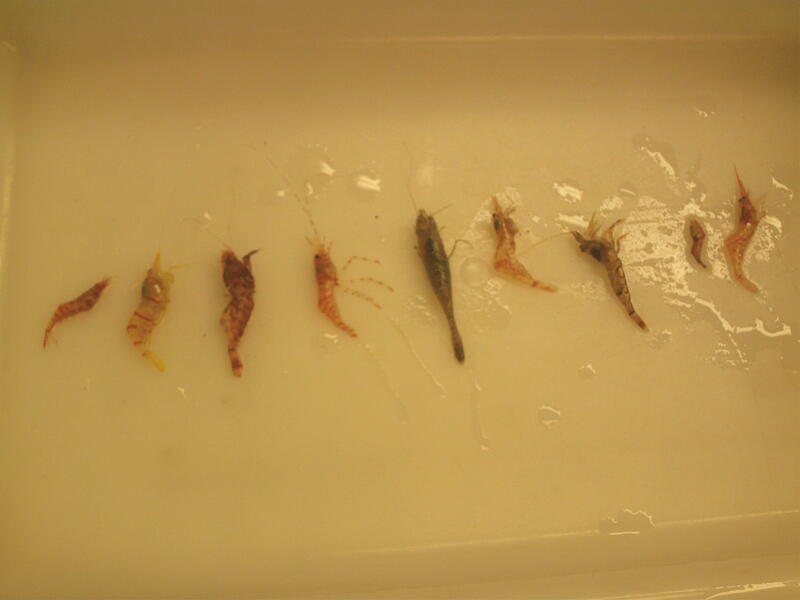 These are some of the shrimp types that we found in our Methot net tow.